There’s nothing we love more than a weekend hunting trip, but do you know what’s not fun? Getting home after your trip and finding inflamed tick bites on your skin. 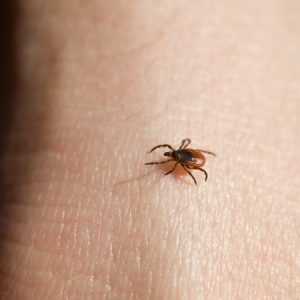 Ticks can cause a number of health problems such as Lyme disease, which is why you should take whatever precautions you can to prevent ticks from finding their way onto your clothing and skin. Fortunately, there are a few simple steps you can take to reduce your chances of tick exposure. Check them out below. Wash your hunting gear in scent-free detergent. Generally speaking, you should wash your hunting clothes in scent-free detergent even if ticks aren’t a concern for you. Deer and other animals can often smell scented detergents, which may cause them to steer clear of your hunting blind. Ticks, on the other hand, seem to be attracted to certain scented detergents. Using a scent-free detergent can increase your chances of success during a hunt, and make you less appealing to nearby ticks. There are plenty of different hunting boots on the market these days, but if you’re concerned about ticks, your best option might be rubber boots. It’s more difficult for ticks to latch onto rubber boots, so they tend to steer clear of them. Since your boots are your first line of defense against ticks hiding in tall grass, you should consider giving rubber boots a shot if ticks have been a problem for you in the past. Apply tick repellent prior to your next hunting trip. If you hunt in heavily-wooded areas, tick repellent is an absolute must. If you’re concerned about using harsh chemicals on your skin, you can also find insect repellents that rely on natural compounds to keep ticks at bay. Just be sure to follow the instructions on the bottle to ensure the repellent is effective. Using a prefabricated hunting blind rather than hunkering down in brush or other natural blinds can also help reduce the number of ticks you come in contact with during a hunt. Give us a call today or contact us online to learn more about all the hunting blind options available from Productive Cedar Products.